Professional carpet cleaning is the only certain way to keep all carpets throughout the house in top shape and looking their best. It is recommended that you subject your carpets to professional cleaning at least twice a year for lasting and proper results. Our carpet cleaning technicians are well trained and capable of cleaning any type of carpet either natural fiber or not. We will dispatch you a team of cleaners who will asses and determine how to go about cleaning the carpet depending on the level of wear and tear and the amount of soiling and staining the carpet has sustained. The process begins with deep vacuuming of the carpet in order to remove any large bits of dirt and debris stuck between the fibers. Depending on the type and state of the carpet, the cleaners will then administer one of the suitable cleaning solutions which may involve the application of special shampoos and solvents which go deep between the fiber strands and work the dirt and dust off the bottom layer of the carpet. In some instances, the technicians may recommend that steam cleaning is the better and more suitable way to clean the carpet though this will up to the customer to decide. The carpet cleaning process is usually completed by another vacuuming and then drying in order to have your carpets ready to walk on in a few hours. The drying time of the carpets is usually a few hours, though it depends on the humidity and ambient temperature of the room. 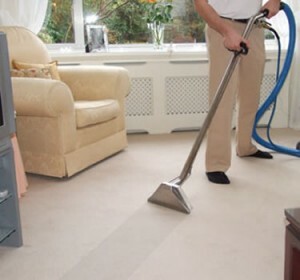 Our cleaners will also apply special techniques in order to lift and remove heavy stains from the carpet, but be aware that certain stains or damage will prove irreversible, this is usually determined prior to commencing the actual carpet cleaning work. All of our carpet cleaning work is carried out using non-toxic, environmentally friendly materials and solutions which evaporate and dissolve completely after the job is done, leaving no fumes, smells or residue in the room. The service runs seven days a week with flexible appointment hours. Carpets around the house receive a serious dose of daily use and don’t take long before displaying the need of serious cleaning. Professional carpet cleaning is the only way to care for your carpets properly in order to keep them looking better for longer. This type of carpet cleaning is an ideal way to care for all types of carpets both natural and man made. It is well worth to have the cleaning done at least twice a year as this is the only proven way to clean deep inside the carpet, all the way to the base as this is where most of the dust, dirt and bacteria accumulate. The carpets around the house are a substantially sized cleaning chore so in order to save you time and money we dispatch a team of specially trained cleaners to get the job done in the shortest time possible with the best results possible. Our carpet cleaning technicians will waste no time as they come ready and equipped for the task at hand. We train them to determine the type of carpet fiber, to assess the level of staining, soiling or damage the carpet has sustained and to select the most appropriate and effective cleaning method. The carpet cleaning process begins with deep vacuuming in order to remove any large bits of dirt and debris stuck between the fibers. Next up is the application of a special cleaning solution. Depending on the type of carpet and its condition, the cleaners will apply the most suitable method, usually involving special shampoos and solvents which go deep between the fiber strands and work the dirt and dust off the bottom layer of the carpet. The carpet cleaning process is completed by another deep vacuuming. Finally the carpets are deodorized and then dried so that customers can enjoy their freshly cleaned carpets sooner. The drying time of the carpets depends on the ambient room temperature and the relative humidity in the house. The carpet cleaning is done using non-toxic cleaning materials which pose no threat to humans or animals and leave no trace or residue. Carpets throughout the house are subjected to heavy, daily use especially in high traffic areas around the front door and the hallways. It doesn’t take long for the carpets to show the need for some serious cleaning. Professional carpet cleaning is the only way to achieve proper results and have your carpets looking clean and feeling fresh for longer. Industry specialists advise that professional carpet cleaning should be done at least twice a year to assure lasting results and maximum hygiene as carpets accumulate dirt, dust mites and bacteria deep down near the base of the carpet which can pose a health problem for allergy prone individuals living at the house. Our carpet cleaning service is performed by specially trained carpet technicians who can assess the level of soiling and staining of the carpet and determine the best way to go about cleaning. The cleaners will be able to handle the cleaning of all carpet fibers both natural and synthetic. Carpet cleaning is a complex and time consuming task for the unprepared, not to us though. In order to keep the appointment time to a minimum and be out of your hair as quick as possible we will dispatch a team of cleaners, equipped and ready for the job in order to complete the task in the agreed amount of hours without costing more time or money. The carpet cleaning begins with the application of special solvents known as carpet shampoos. Their job is to loosen and work off any large bits of dirt and debris usually found near the bottom layer of the carpet. In some cases, the technicians might recommend combining this with a session of carpet steam cleaning, though this depends on the level of soiling and customer preferences. The cleaning is completed by a thorough vacuuming session and the application of a quick drying system in order to have your carpets fresh, clean and ready to walk on in a matter of hours. The carpet cleaning is done using non-toxic, bio degradable products which leave no nasty smells or residue in the carpet or the room.